Lionette Lauren Ruehlen eyes a shot as the basket during hoop action Friday night at CCHS. 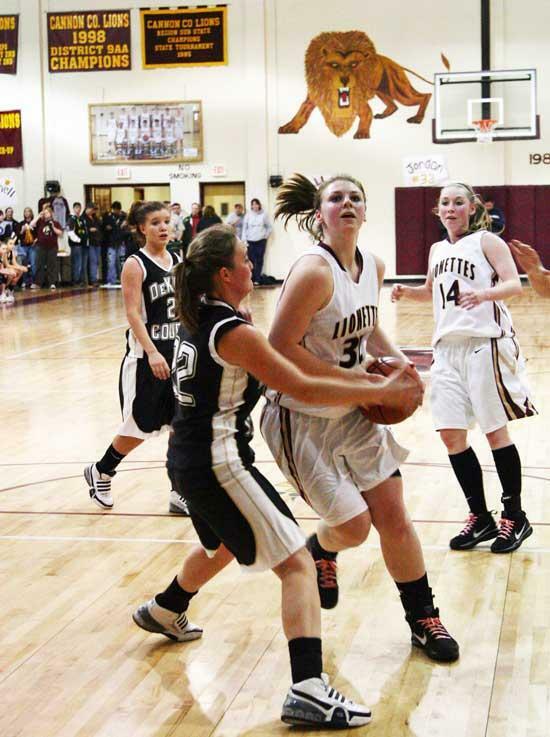 Cannon County hosted the DeKalb County Tigers and Tigerettes at the Robert A. Harris Gymnasium on Friday, February 5. The Lionettes faced a much improved Dekalb County team. Cannon County jumped out to an 8-0 lead at the 5:20 mark, but a determined DeKalb team fought back with four 3-point baskets to cut the lead to 13-11 with 40-seconds left, and with a 3-point basket at the buzzer, the Tigerettes went ahead 14-13. The second quarter saw the lead change hands several times with Sissom hitting a basket and a foul shot giving the Lionettes a 16-14 lead only to see DeKalb take a 17-16 lead with under 7:00 to play. The lead was swapped three times with the Lionettes finally taking a 23-22 lead at the 3:35 mark on a Sissom basket. The Lionettes outscored DeKalb 6-2 for the remainder of the quarter and with Ashley Campbell’s 2-point basket at the buzzer sent the Lionettes into half time with a 29-24 lead. Both teams had a difficult time finding the bottom of the basket in the third quarter with the Lionettes hitting only 3 of 9 from the field, and DeKalb 2 of 8. Cannon was able to build on their lead ending the third with an 8 point lead, 39-31. The fourth saw both teams come alive offensively. Taylor King led the Lionettes with 8 points in the quarter, followed by Chelsey Payne with 6. Cannon held off a determined DeKalb team to take a 61-50 district win. Emily Sissom 16 points; Taylor King 15; Lauren Ruehlen 13; Chelsey Payne 9; Ashley Campbell 7; Erica Melton 1. The Lions were looking to avenge an earlier season loss to the Tigers from DeKalb County. The previous game was extremely close and this one was expected to be a barn burner with a full house in attendance. The Lions started the game with a Justin Davenport 3-point basket, but DeKalb answered with 5 straight points taking a 5-3 lead at the 5:30 mark. Davenport hit his second 3 to put Cannon ahead, 6-5, but DeKalb was able to tie the score at 8-8, and went ahead 10-8 at the 2:25 mark. The Tigers finished the quarter scoring a 3-point basket to take a first quarter 13-8 lead which they never relinquished. The second quarter saw Cannon from the field hitting only three of their 12 shots. DeKalb had several back door cuts to the basket leading to layups and 50% shooting from the field as they stretched their lead to 29-16 at the half. Cannon fell behind by 15 in the third quarter trailing 39-24 at the 3:40 mark. Colin Jones tried to get the Lions back into the game hitting three 3’s in the quarter. The Lions were able to get within 13 with 1:30 left, but a basket by DeKalb pushed the lead back to 15 at the 1:00 mark. Jones’ basket at the end of the quarter got the Lions closer, but still trailed 45-33. The Lions ran out of steam in the fourth, shooting only 25% from the field. Forced into a foul situation, DeKalb went to the line fourteen times hitting 10, leading to a 9-2 run midway through the quarter ending with a 63-42 win over the Lions. Justin Davenport 13 points; Cody Ruehlen 9; Colin Jones 9; Jared Nave 4; Matthew Turney 3; Andrew Woodin 2; Brian Cripps 2.